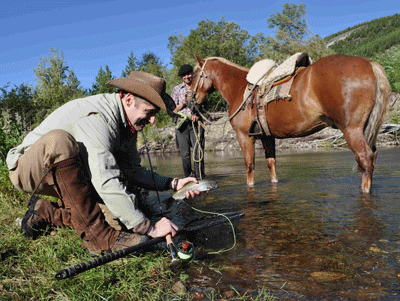 A few days before I boarded the airplane to Chile, headed to the Aisen region of Patagonia, I told lodge owner Gaston Urrejola, that I wanted to catch a wild trout, on a dry fly, from the back of a horse. Gaston and his brother Claudio are the owners of Coyhaique River Lodge, one of the finest fishing lodges it has been my pleasure to enjoy. And the Coyhaique River is their playground. To make my dream a reality, Gaston chose a stretch of intimate water and a steady Chilean gelding. Casting upstream and gathering line back caused the coils to gather around the horse’s legs, a liability that could have provoked a rodeo. On subsequent casts, I coiled the line in my left hand. After the second run, I brought it close and then dipped the long-handled net. The trout didn’t like the look of the horse and the horse didn’t like the look of the fish. They each tried to get away from the other, but my 4x tippet brought them back together. The horse’s handler stepped in to calm the gelding while I concentrated on staying in the saddle and bringing the fish to the net. 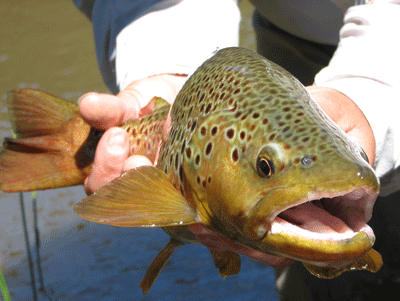 On dry land, the horse calmed enough for us to net the trout and release it. Gaston and Claudio take pride in showing their clients different water every day. Seldom does any lake or stream see more than three or four days of pressure in the season. The guides speak good English. One of the guides is Alejandro Trepiana. If you like classic rock, you might get him to play his guitar for you in the evening. He is an accomplished musician, as good with a guitar as he is with a fly rod. If you are a fan of the band Rush, ask him to play something from Exit Stage Left!